In lieu of my usual "Bad Costume Wednesday", I wanted to take this chance to show you some of the stellar outfits I saw while at Dragon*Con this past weekend. I was really blown away by the time, dedication, hard work, and imagination people put into assembling these costumes. What struck me the most was not only how good they looked, but how much fun they were having. Almost without exception, they were eager to stop for pictures, and were happy to strike the most super-heroic of poses. When you see comic-book clothing brought into the real world, you're immediately faced with problems you never have to consider when you're just drawing lines on a page. How do you hide the seams of a soft boot top as it joins with the shoe? Where does Flash's zipper go? How do you keep a cloth face mask from slumping off your cheeks? These guys and gals have dealt with all of that and more (don't ask me how they go pee, for instance, I'm pretty sure it involves some sort of complicated AMA-certified device). 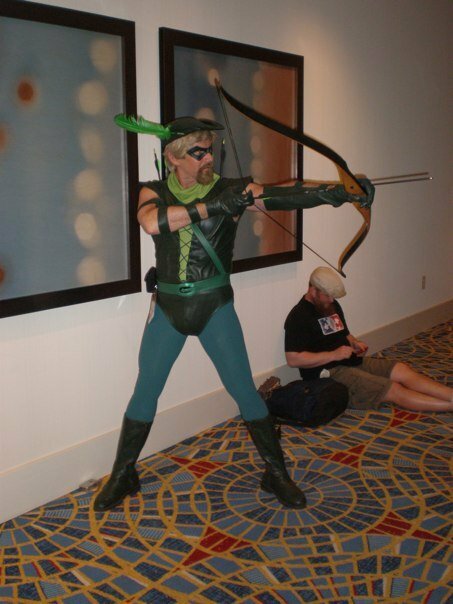 So without further ado, I bring you the Best of John and Jeff's Magical Mystery Dragon*Con Tour in photos. 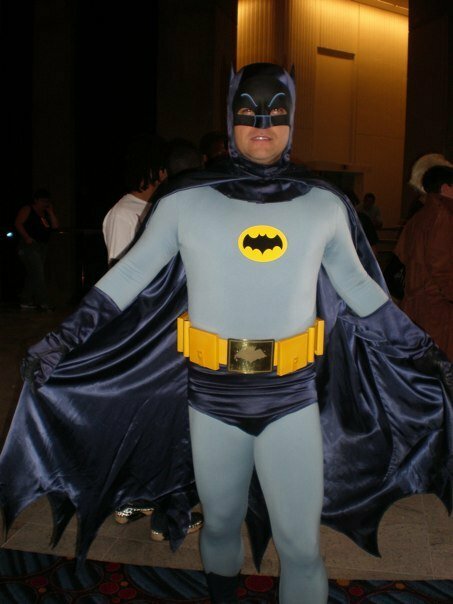 He's got it all, from the paunch to the big square utility belt to the colors and little bat ears on the cowl. Attention to detail matters when you're doing something in real-life as much -- or more! -- as it does when you're creating an illustration. I didn't get a chance to talk to him, but I wouldn't be surprised if a significant portion of that costume was store-bought, it was just that perfect. I particularly like the pose. 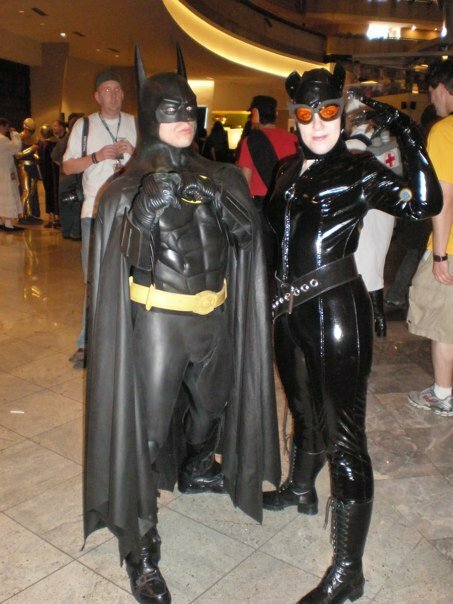 And the fact that he brought Catwoman along with him, thankfully without having to sit through her film. Well played, sir. Another Justice League-er was the first one that made me stop and take a photo. 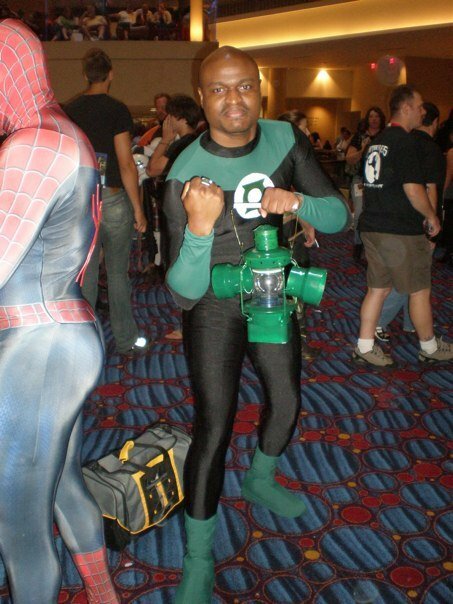 I've got a fondness for The Flash going way back to my ill-spent youth, and this guy nailed the costume. From the perfectly placed mask to the high-water lightning bolts on the arms to the head wings that actually didn't look stupid, I was really impressed with this one. The right green makes a world of difference with those two, particularly GL. A couple of alternates were running around that missed the right tone and the result was ugly. One guy looked more like the Green Vomit. None of the various Supermen were all that beefy, which is fine with me -- I never really liked the Kryptonian Bodybuilder concept. I have to say, though, you've got to be pretty confident in your manfulness to wear skin-tight briefs like this. Seriously. 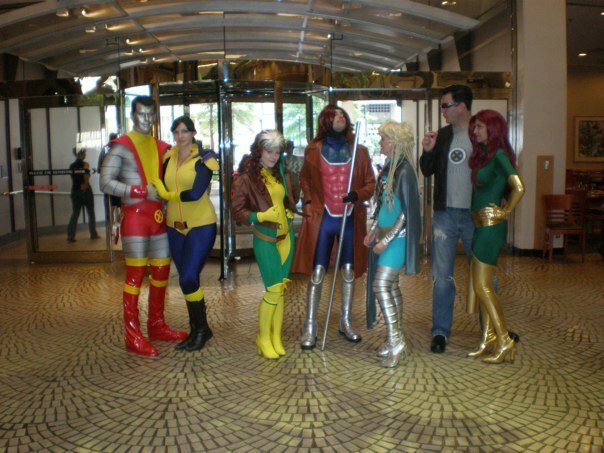 Moving on to Marvel, several folks got their friends together and came as a team. The coordination issues alone boggle my mind. These guys represented old-school Avengers well, although perhaps as a bit long-in-the-tooth. 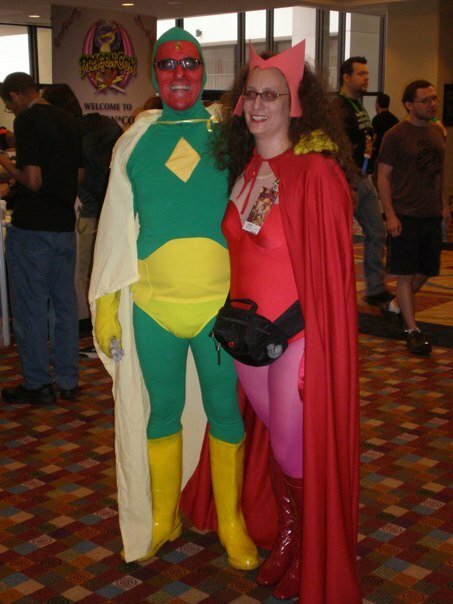 Particularly Vision, who as an android should be able to keep it tight pretty much forever. Sill, they were a cute couple and I definitely applaud their willingness to geek it up later in life. May we all be so lucky! 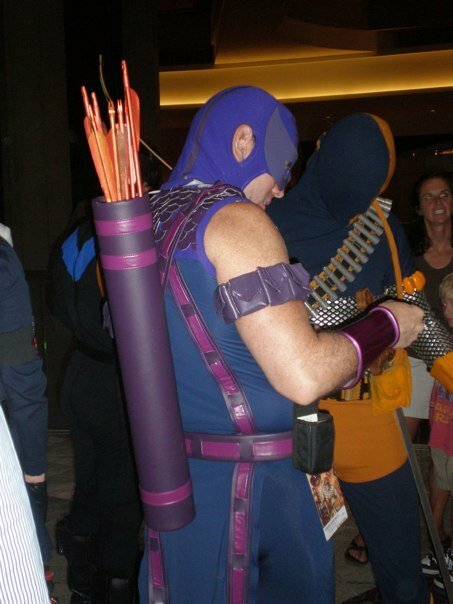 I really wish I'd gotten a better shot of Hawkeye, I don't know how this guy put his costume together but it was really spot-on and totally convincing. When I saw the next "team", I had several reactions. 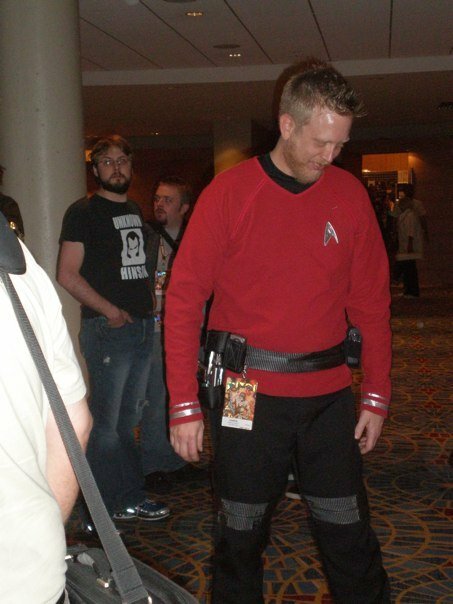 First, I wondered how I could swing it so I could show up at a major convention wearing a bathrobe and slippers. 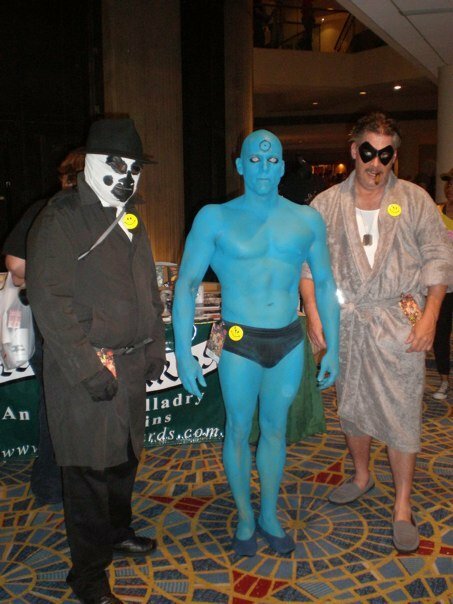 And second, I thanked my lucky stars the Dr. Manhattan guy decided to go with the "with pants" version. Whew! You know, it's funny, but I remember her being a lot hotter than that ... ah, here we go! We had a great time, I can't thank my best friend John enough for putting me up and showing me around. The Patrick Stewart panel was fantastic, we had a great hour listening to Darwyn Cook talk about his career and the industry, and the costumes and geekage were simply outstanding. We're thinking of going back next year and putting up a HeroMachine booth (assuming I am still employed by UGO then) and setting up a big projection unit with a computer so people can see characters being put together. We'll see how that works. Hope you enjoyed the photos, and next time you're assembling your HeroMachine creation, think about how it would look in real life strolling around downtown Atlanta! This entry was posted in Cool Characters, Meta, Randomosity, Super-Hero Stuff. Bookmark the permalink. I’m there if you need help. 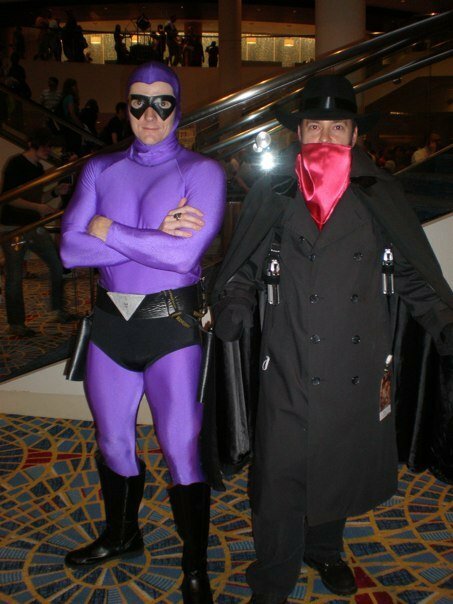 I have to say, that Phantom costume is far better than the one in the movie, same for Superman and Red Sonja costumes too. While browsing the internet I saw this costume which I thought was pretty cool. Although being the forgetful idiot I am I can’t remember what it’s from. Anyone care to remind me? Did you dress up Jeff? There are a lot of ways the sentence that begins “While browsing the internet I saw …” can end, I’m glad yours took a turn to the light side, Anarchangel! I also really liked how Superman and Keaton-Batman fitted the part, face-wise. I almost tought it was really Michael Keaton at first. Question, tough: The Doc Manhattan guy, did he wear a costume or did he really paint himself blue? I guess Dragon*Con must be a pretty hot place(as in, the temperature) if you can wander around almost naked like that. I agree with collex. It was hot, obv. Specially Starfire! WOOOOOOOOOOOOOO! The guy that’s dressed as the Comedian is scarily accurate. I never thought I would give a guy dressed in a bathrobe props, but look at him – it’s freakin’ Eddie Blake! There are some things one can not unsee! Ze goggles! Zay do nothink! Hi Brian, thanks for stopping by! 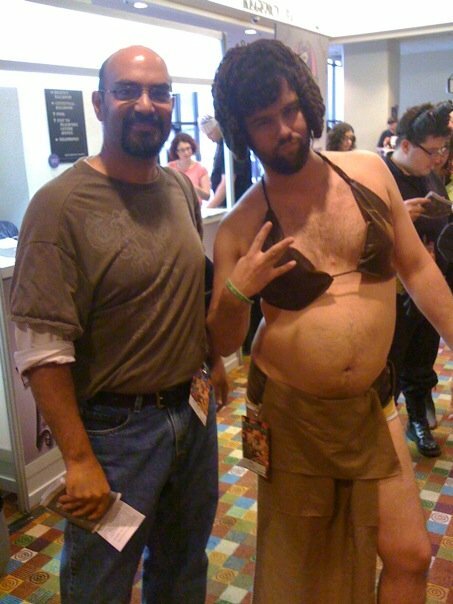 Both your costumes were simply outstanding, really impressive. If you ever want to share your tips and experiences on putting them together, I’d love to do an interview some time.